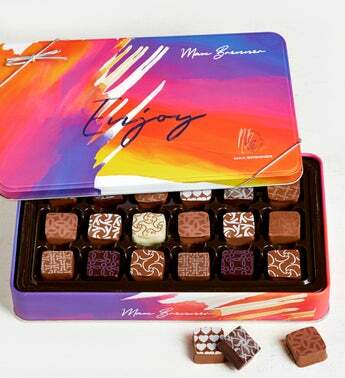 Design & chocolate creativity come together to celebrate the art of chocolate with this tin of 18 decadent, signature Max Brenner Chocolate Bon Bons. Each carefully handcrafted and hand printed Bon Bon is made in the French Tradition for rich taste that’s unmistakably Max. This unique bon bon tin contains two pieces of: Dark Chocolate Praline with Hazelnut Cream, Dark Chocolate Praline with Whiskey, Milk chocolate Praline with Roasted Coconut, Milk Chocolate Praline with Pecans, Gianduja Milk Chocolate Pralines, Milk Chocolate Praline with Sea Salt, Milk Chocolate Praline with Walnuts, Milk Chocolate Praline with Peanut Butter, Milk Chocolate Praline with Cornflakes and Chili. 5.9 oz. Tin contains two pieces of: • Dark Chocolate Praline with Hazelnut Cream • Dark Chocolate Praline with Whiskey • Milk chocolate Praline with Roasted Coconut • Milk Chocolate Praline with Pecans • Gianduja Milk Chocolate Pralines • Milk Chocolate Praline with Sea Salt • Milk Chocolate Praline with Walnuts • Milk Chocolate Praline with Peanut Butter • Milk Chocolate Praline with Cornflakes and Chili • Gift Measures 9.5" x 5.5" x 1.5"
Design & chocolate creativity come together to celebrate the art of chocolate with this tin of 18 decadent, signature Max Brenner Chocolate Bon Bons. Each carefully handcrafted and hand printed Bon Bon is made in the French Tradition for rich taste that’s unmistakably Max and features Dark Chocolate Pralines with Hazelnut Cream and with Whiskey as well as Milk chocolate Pralines with Roasted Coconut, with Pecans, with Gianduja, with Sea Salt, with Walnuts, with Peanut Butter, and more.